In what may have been his best performance as a professional fighter, Timothy "Desert Storm" Bradley (25-0, 11 KO's) fought a sensational fight and took a 12 round unanimous decision over previously unbeaten Lamont Peterson (27-1, 13 KO's). 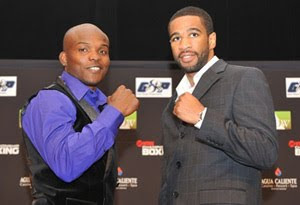 With the victory, Bradley retained his WBO Junior Welterweight title. The official judges scored the bout 118-110, 119-108 and 120-107. I had the fight scored 119-108 for Bradley as well. In the 1st round, Peterson displayed a strong body attack and backed Bradley up with an effective jab. Bradley got better as the round went on, and connected with a hard left hook to the body. Then, Bradley landed a solid right on Peterson's chin. Bradley timed the punch perfectly because he threw it right over Peterson's jab as he was bringing his left hand back. In round two, Bradley started where he left off in the first round. He was timing Peterson and connected with a big right hand. Then, Bradley scored with a hard left hook to the body and landed a vicious left uppercut. Bradley was throwing and landing his combinations beautifully. All of the punches that hit Peterson were coming off his jab. When he finished throwing a combination, Bradley fired the jab again to make sure Peterson was not in range to hit him. Peterson was not moving well laterally in the 3rd round and Bradley made him pay. He hit Peterson with a volume of rights and lefts to the body. After that, Bradley dropped Peterson with a solid overhand right that landed above Peterson's left ear. However, Peterson would come back strong. As they were exchanging a series of blows, Peterson started to hurt Bradley with his body punches. Bradley was momentarily stunned by a left hook to the body. In a very competitive 4th round, both fighters continued to attack the body furiously. Bradley backed up Peterson when he landed a sharp, right uppercut. As the bell sounded to end round four, Bradley connected with a left hook. Bradley is a very durable junior welterweight, and showed it when he absorbed a flush right hand from Peterson in the 5th round. However, Bradley landed more meaningful punches and was able to place his shots more efficiently than Peterson. In round six, Peterson continued to fight bravely, but Bradley was hitting him with some real crisp combinations. Bradley proved that he was the more technically sound fighter as he continued to beat Peterson to the punch in the 7th and 8th rounds. Bradley repeatedly utilized a well-timed jab and skillfully moved around the ring. He continued to finish his combinations with jabs or hooks. When Peterson was in close range, Bradley would catch him with overhand rights. Bradley kept Peterson turning, and rarely stayed in his range to be countered. Peterson wanted to turn the fight into a brawl, but Bradley was smart. He just kept boxing Peterson, and would not let him get set to land meaningful punches. As the fight moved into the 10th round, Bradley had the higher and more thriving work rate. When Peterson's punch output dropped, it enabled Bradley to connect with a vicious left hook. Bradley did a nice job of mixing up his combinations to the body, and then attacking Peterson's head. Bradley preferred to box, but when he was hit, he aggressively fought back. Showing no fear when exchanging blows, Bradley just kept punching and slowed Peterson with body shots. Peterson came out ferociously in the 12th round, but Bradley remained poised and a step ahead of him. As he did for most of the fight, Bradley unleashed his punches when he was at a safe distance from Peterson. However, knowing it was his last opportunity to pull out a win, Peterson applied enormous pressure, which resulted in both men slugging it out until the bell rang to end the fight. After his dominating performance, Bradley has some options at 140 lbs. Bradley could face Amir Khan, who just kayoed Dmitriy Salita in the 1st round. Another opponent could be Paulie Malignaggi, since he outpointed Juan Diaz over 12 rounds convincingly in their rematch. Juan Urango, Devon Alexander, Marcos Maidana and even Ricky Hatton present more possibilities. Timothy Bradley has clearly improved with each fight and would be a handful for any future challenger. Also, on the undercard, 33 year old Vic "The Raging Bull" Darchinyan (33-2-1, 27 KO's) scored a devastating 2nd round knockout over Tomas Rojas (32-12-1, 22 KO's). With the victory, Darchinyan retained his WBA & WBC super flyweight titles. Again, Darchinyan appeared to have some trouble with a tall, rangy fighter. In the 1st round, Darchinyan started a bit slow. Rojas connected with a solid overhand left that surprised Darchinyan. Rojas, a southpaw as well, was trying to control range with his right jab. Darchinyan answered with a lunging right hook to Rojas' head. Darchinyan also hit Rojas with a left uppercut and followed it with a strong left to the body. Then, in the 2nd round, Darchinyan missed a left uppercut, but landed a clean overhand left to Rojas' face. Next, Rojas made a gesture with his gloves, signaling Darchinyan to keep bringing it. Well, with the very next punch, Darchinyan delivered the knockout blow. Rojas got nailed with a crushing left that snapped his head back and dropped him to the canvas. The time of the knockout was 2:54. After the fight, Darchinyan noted that he would like to avenge his only professional losses to Nonito Donaire and Joseph Agbeko. First, he would like a bout with Donaire, but Donaire needs to win his upcoming bout in February against Gerson Guerrero. If Donaire is successful, expect a possible match up in the middle-end of 2010.